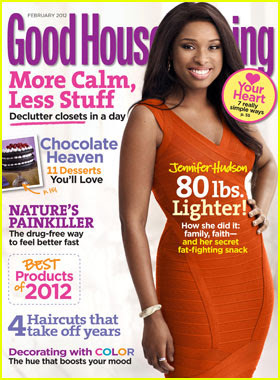 Lush Fab Glam Inspired Lifestyle For The Modern Woman: Weight Loss Tips From Actress Jennifer Hudson! Weight Loss Tips From Actress Jennifer Hudson! Academy Award winner and music artist Jennifer Hudson has gone from being overweight at 236 pounds to a healthier but still curvy version of herself right before our eyes. She covers the February 2012 issue of Good Housekeeping magazine where she shares her weight loss secrets and tips on how she maintains her fabulous new body. Even weight loss is a family affair. In late September, she opened the Weight Watchers Jennifer Hudson Center in her hometown, Chicago, where many members of her extended family now hold their meetings. "Over 75 of them are doing Weight Watchers, and they've lost over 2,000 pounds altogether," she says proudly. "My cousin beat me — she's lost 112 pounds!" For her recent 30th birthday, her sister, Julia, asked for gift ideas. Hudson's request: a tin filled with popcorn from a favorite local store called Let's Get Poppin. "But the gift that I wanted was the nutrition facts, which Julia got for me!" she says with a laugh. "Now I know that the caramel popcorn is four points a cup while the cheese popcorn is five; I know exactly what I'm putting in my body. And that makes me so happy!" Breakfast is often an egg-white omelette with a little smoked salmon or turkey bacon, sometimes with toast; for lunch, she'll have thin-crust pizza loaded with healthy toppings or the salad she concocted from all her favorite ingredients — greens, goat cheese, shaved almonds, tangerines, dried cranberries, chicken, and vinaigrette dressing. "Mmm, it's like your taste buds are dancing," she says. Because lunch is usually her biggest meal of the day, she has something smaller for dinner, depending on how many points she has left — anything from fruit to her healthy remake of a childhood meal: turkey wings (boiled, not fried, and then baked for a little crunch), sweet potato fries, and greens. "I was always active to a certain extent, but if you're not eating right, it doesn't matter," she says, shaking her head. "If you eat a banana pudding and then go run, you're only running off the calories you just ate, so you're really not losing anything." ... "Food is meant to be used as fuel for our bodies. If you're using it for any other reasons, take a step back and ask yourself what's up,"
Hudson's goal was always to look slim but still curvy, not buff: "I don't even want muscular arms. I like a natural look," she insists. And she isn't a fan of extreme workouts. When she occasionally watches a weight-loss show on TV, she gets frustrated at the trainers. "Look at what you're doing to these people," she says, shaking her head. "People are throwing up, falling down, about to die. How is that supposed to help them? Forget it. [When I see that,] I'd rather be at home, overweight. I'm not knocking trainers, but that's not what an everyday person wants to do." What do you think of Jennifer Hudson's nutrition and exercise ideas and will you be trying any of her weight loss tips? Leave a comment below. Good Share! Some really valuable information here. Thanks for sharing your knowledge. Look forward to reading more of your articles. Voted up! Thank you, it's a readers favorite post.